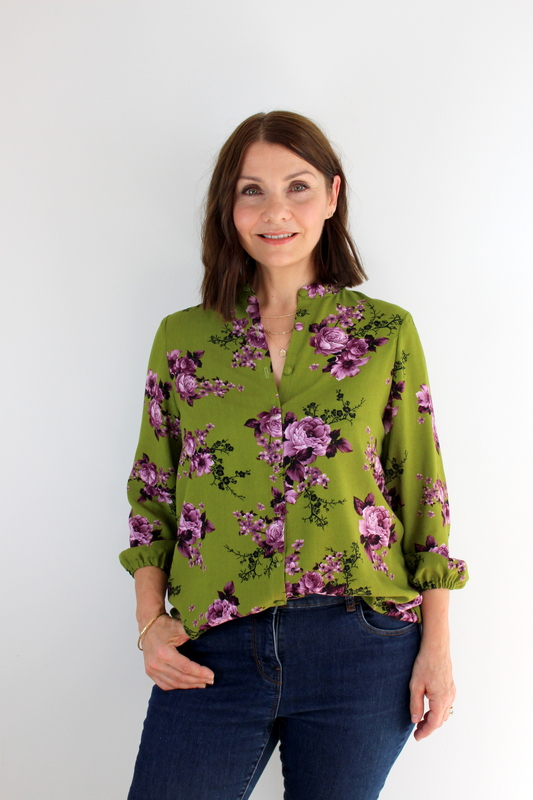 Home / Pattern Reviews / ‘The Blouse’ from The Avid Seamstress. The latest release from The Avid Seamstress is another winner. I have previously enjoyed making her Shift Dress and Day Dress, and I knew from my experience with these that The Blouse was going to be a beauty to sew up. I was right. It is a simple classic design, and as you can see from the line drawings above is loose fitting, without darts, and features a pretty Mandarin collar, button placket, and elasticated 3/4 length sleeves. I have been on the hunt for a great blouse pattern for a while. I have one or two that I have in mind to sew up over the next few months, but as soon as I saw this new release it jumped the queue big time and I hopped on and purchased the PDF so that I could make it straight away. I just could not wait. My first version was made using this pretty blue patterned viscose from The Frugal Fabric Shop. Unfortunately I believe this has sold out now, but do head on over to check out Kate’s shop. I know at the moment she has some other fab viscose fabrics (at bargain prices) that would be equally as lovely as this. If you have never sewn an Avid Seamstress pattern before, then you are in for a treat. 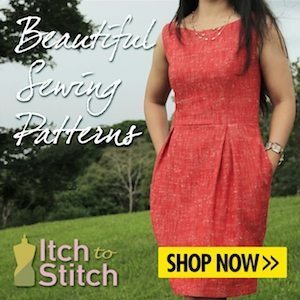 I would thoroughly recommend that you take your time to read through the instructions (rather than skip through them in a rush – as I often do with sewing patterns), as they are jam packed with helpful and clever tips to help you. I guarantee this will save you time in the long-run and give you a much more enjoyable sewing experience. For example, I love that she advises you to overlock/finish your edges before you start. Also you are told exactly which edges do not need to be overlocked too. Brilliant. You are taken through how to block fuse one of your collar pieces to ensure a neat crisp collar, and maybe to cut the collar just before you need it if you are using fabric which is prone to fraying. All great tips. I chose to make a size 2. I fall between a size 2 and 3 as far as my bust measurements go, and looking at the finished garment measurements I decided that the size 2 would be the fit I was going for. It’s perfect. Not too loose, not too tight. The minute I finished my first version I was planning my next. I recently attended the #sewbrum sewing meetup in Birmingham and one of my fabric purchases there was this gorgeous green viscose with pink flowers. As soon as I clocked it, I knew what I was going to make with it. Taking your time will really pay off. The button plackets are interfaced and will lay nice and neat if you are accurate with your measurements. For this version I wanted to use self covered buttons for a change. They are quick and fun to make, and I tried to cover them with carefully picked pieces of fabric, so that when the blouse is buttoned up, they would match the placket that lays over the top of them. I particularly love the sleeves. Three quarter length sleeves are perfect for me, I made no adjustment on the length, but I did need to cut a shorter length of elastic than the guidelines suggested, so do measure your arm where the elastic is going to sit to make sure it is going to be the correct size for you. To ensure that the collars are evenly sewn, I followed the tip to lightly draw the seam allowance (1cm) on the curved edge before sewing. It’s all about making life easier for yourself, right? It is finished off with a neat line of edge stitching. I’m pretty sure I will be reaching for this classic pattern for years to come. I’m imagining it in a classic white cotton – I haven’t got a classic white shirt ….yet…. or perhaps in a stunning jewel coloured silk. Divine. I’d love to hear what your favourite classic shirt/blouse pattern is. Do share it with us all in the comments below. Next post: The Lisbon Cardigan from Itch To Stitch. Impeccably sewn! That’s just gorgeous. A beautiful shirt and the green fabric is gorgeous! Both your versions are gorgeous! I love the detail shots you included, the buttonholes look beautiful. lovely shirt and the covered buttons are a great detail. I bought the pattern yesterday and great to read a revie before sewing. I made the box shirt by the maker’s atelier last week and found that a great shirt to make & wear.